Sandy, wet and windy. Those are the three words that immediately spring to mind if I were to describe Sandman sprint triathlon 2012. The name kind of gives it away, but if I’m allowed two more I’d branch out to “brutal fun.” This was my fourth and final triathlon of 2012 (my fifth in total) and it was almost a year since completing my first one in Nantwich, which was very beginner friendly. In comparison, Sandman was an evil Welsh dragon of a tri! First up, a sea swim and I’m not talking calm seas here, this was the north Wales coast in September. Follow that with an undulating 18km bike course, before a 5km off-road run, finishing over the sand dunes. When I entered it, I imagined an Indian summer; beautiful sunshine, clear blue skies and pancake flat water. But as we all know, summer 2012 didn’t exist and I arrived on Anglesey knowing I’d be battling the elements. I went to recce the swim course the day before the race. Temperature wise, it wasn’t too bad. Conditions wise, it was dreadful. Waves, waves and more waves! I got a mouthful of sea water every time I tried to take a breath and stopped every few strokes because I felt so disorientated. The following morning there were dark grey skies and cold winds to add to the mix and the rain started to fall just as I took my box into transition. The organisers had warned us at registration the previous day that the swim course would be changed if conditions were bad, so it didn’t come as a great surprise to hear they had to delay the start of the race and they had moved the swim to a more sheltered part of Llanddwyn bay. This meant we’d be swimming out and back, rather than along the beach and it added a cheeky extra 1km run to transition. Watching the first group go off, I kept thinking how grateful I was to only be doing the sprint. I also thought thank god I’m not one of the safety canoeists. They probably had a harder job than us to fight against the crashing waves. By the time it was our turn to enter the water, I was freezing. My hands are usually white in winter anyway (Reynaud’s), but they’d gone beyond white. They were purple and my lips were blue. I just wanted to get moving. 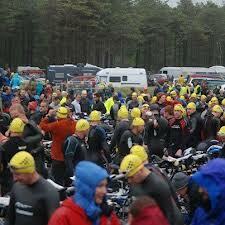 It was a mass start from the beach and being a sea swim virgin, I hung back a bit. In hindsight, I should have just hit the front and legged it into the sea, as I ended up getting caught with people all around me, some of them much slower. But with beastly waves to contend with too, I knew it wouldn’t be a fast swim. Breathing was interesting; you had to time it to perfection in order to avoid a mouthful of water. Sighting was also an issue. It was impossible to see the buoys through the waves. I ended up too close to the turn buoy, which jammed me in a pack and I had to breaststroke around it. But once I was heading back towards the beach, I finally managed to find some space and rhythm. It was hard to know exactly when to stop swimming and start running. I think I did it a few strokes too soon, but I forced my way out of the water and up onto the beach, found my trainers and started running back through the forest towards my bike. I got a little confused in transition and tried to put my cycle shoes on before removing my wetsuit... always useful! But after putting an extra layer on to keep me slightly warmer on the bike, I got going. I passed a few people heading up hill out of the forest but that was about as much overtaking as I managed. Come the longer, steeper hills, I was passed by a few guys and a woman on aero bars. I didn’t let her get too far ahead and the 18km flew. It wasn’t as wet or as hilly as Harlech, and certainly not as windy. Plus I didn’t have two punctures to contend with like on Slateman. So I was chuffed to come back into T2 smiling and not too far behind. Transition this time was a simple case of changing my shoes and taking my t-shirt off. No confusion, no messing around. I needed to chase down aero-bar woman! Thankfully I caught her within the first 1km and the guy ahead of her, and the one in front of him. Then there were two more people in my eyesight I was determined to get ahead of. I passed the guy and pushed hard to catch a woman a few metres ahead of him. I didn’t stop for water. I was on a mission. I edged ahead of her, but could hear her right behind me and she came past me on my right. I wasn’t having any of it! I decided I wanted it more than her, so I increased my speed slightly and pushed ahead of her once again. I kept looking ahead and told myself she wouldn’t pass me again. After coming out of the forest, the sand got deeper. It’s not the easiest of surface to run on. Hills of sand are even harder! But I stuck my head down and made it over the dunes. The testing conditions didn’t subside and as soon as I hit the beach, the headwind hit me full on. But I knew I didn’t have far to go and focused on getting to the finish line. It came too soon for me to catch anyone else but it was a welcome sight as I didn’t think I could maintain my pace for much longer. I finished in 1’29 and I was shocked but delighted when I found out I came 6th female overall, because more excitingly, I know I can push myself harder. I’m sad it’s the end of the tri season so soon, but I’ve achieved more than I ever thought possible over the past 12 months. I’ve also met some amazing people through triathlon and had some life changing encounters. I honestly can’t wait to get more miles in and training under my belt over the winter, to see what 2013, the year of the Ironman (!) will bring.